PRINCETON, FL. 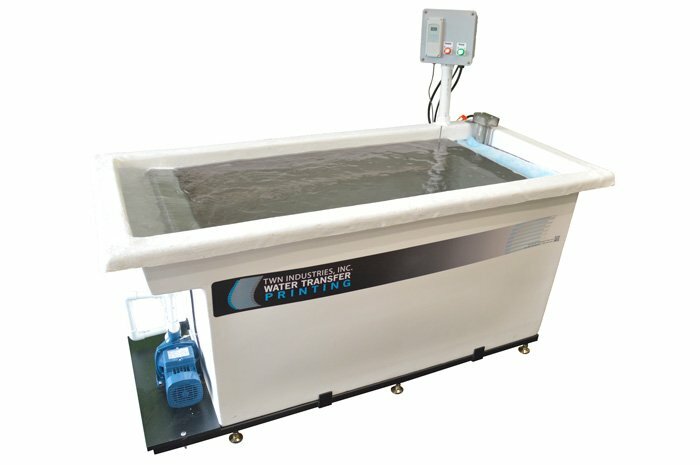 — April 27, 2010 — TWN industries is proud to offer the first Water Transfer Printing system designed for entry level aftermarket decorators and lab sampling. This first of its kind system is designed with the small parts customizer in mind. The functional processing area of 48” long by 24” wide and 30” deep is ideal for their custom decorating needs and requires only a small physical footprint. The integrated three-stage stage processing system includes a main processing tank, thermostatically controlled heater and heating tank, surface reclamation skimmer and filtration trap. This new entry system is built to the same stringent guidelines that TWN Industries has established for all of their high volume production equipment. Along with purchase of one of the WTP 1.2 the decorator also gains access to the hundreds of license free film that TWN has to offer. The WTP 1.2 aftermarket processing systems competitive price is quite a bargain and as always comes with two days of hands on training at TWN’s state of the art training facility in Princeton, FL. This industry gold-standard training is configured to cover all aspects required for a new water transfer printing operation or can be customized to meet your specific needs.